Great hostel, fantastic atomosphere, friendly staff. 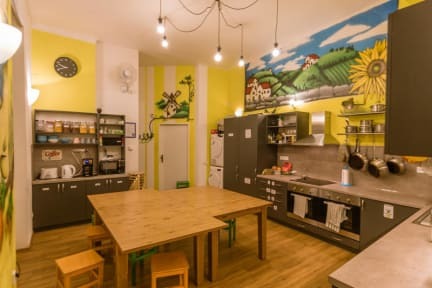 Best hostel experience I’ve had in Europe. The staff was incredible and I had so much fun I can’t wait to return in the future. 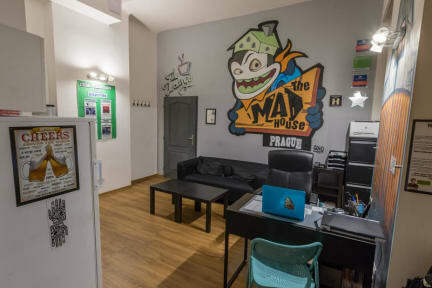 Prague has my heart and Madhouse plays a huge part in my experience. Cheers, guys! Until we meet again! The best hostel I’ve stayed at in a long time! Staff were so great, super clean rooms and bathrooms, great kitchen (with free pasta and cereal etc), family dinners, great nights out and an amazing location. Absolutely brilliant hostel, the staff were super friendly, there was always something to do! I'd definitely recommend this place if you are travelling solo or are looking to party. Hopefully we will return in the future! Keep it up guys! The staff were really amazing at madhouse. They were hospitable from the moment I arrived, I was clearly exhausted and they made me a coffee and let me use the lounge and watch Netflix for a few hours until I could check in. During that time, each member of staff came in to introduce themselves and chat. It was really welcoming. The activities every day were awesome too. Highly recommend, especially for solo travellers. Hostel is perfect for partying. Staff is the best from all of the hostels i've visited by now. They keep full attention on guests, play drinking games, show you arround and go out with you. Best for solo travelers and meeting new people, and has a good guys/girls ratio. Only downside is that one of our hostel mates got robbed since the lock on the room's door was broken, but I am sure they will fix that, also tram station is in front od the hostel so you can hear sirens of tram during the night. I had SO much fun here!!! A little more expensive than other hostels, but worth it for the amazing staff, great crowd and organised events. By the end of the first day felt like I was part of the family. We all knew each other by name. Fun events like Bob sleighing, drunk bowling, 90s nights. Great pre drinks all together with "Kurtis' dice game".